Bristleworm and Snail Friends | Nicole, Deipnosophist. While watching the reef aquarium with A tonight, I watched as the enormous turbo snail padded along the front glass. He’s grown a lot since he was added to the tank; he’s at least 2.5 inches across. 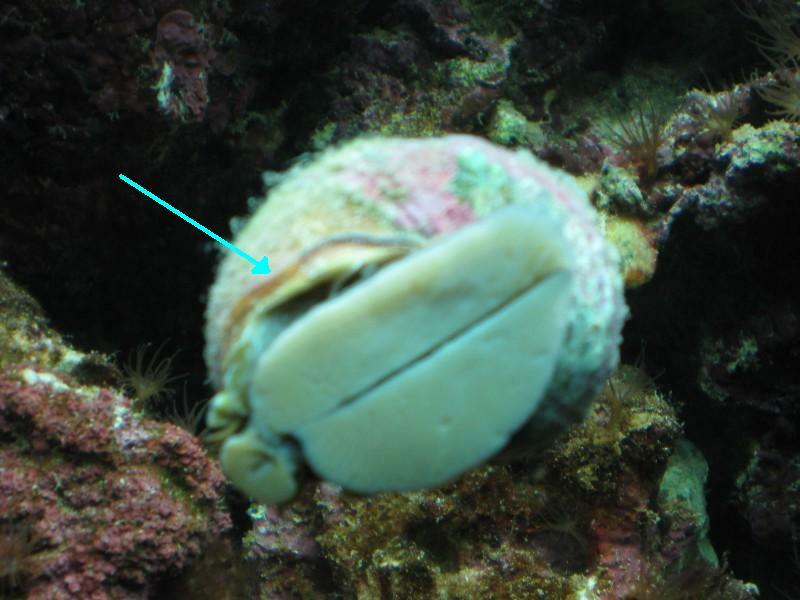 Then I noticed- there is a small bristle worm living in his shell! I tried to take a picture that would really show the two, but my stupid camera would not focus on the right spot and by the time I went to read the owner’s manual, the snail had shuffled off elsewhere. Too bad, or I would have found a cutsie interspecies picture page and posted it. Hopefully the tank’s not too infested; bristleworms can either be harmless or can grow to be a giant nuisance. Speaking of infestations, my tank is so full of Aiptasia that I’m considering giving up on keeping any other sessile animals. The remedies I have tried are either ineffective or they require injecting each anemone. Anyone with an infestation can tell you that it would take hours to inject all 300+ of them, and who knows if it will work, or just release stinging cells into the water and poison the tank. Buying a copperband butterfly (Chelmon rostratus) to eat them just seems irresponsible, as the butterflies often die soon after their natural food is gone. I recently read that the seagrass filefish (Acreichthys tomentosus) is hardier, plus they are such unusual fish. I can’t find anyone who sells them though. This entry was posted in Aquatic by knharter. Bookmark the permalink. Joes Juice … although, like you said, you have to inject ’em. It’s a battle for me, too. I’m gonna have to do it (again) this week. Thanks for the tip, Jeffry. How often do you inject them? You need a loaner program for the copperband butterfly! I don’t know a lot about tanks – is yours a saltwater one? My friend had one and I was constantly mesmerized by it. So incredible and beautiful! Use Joe’s Juice and Peppermint Shrimp will eat them, try getting 3 of them or so.